April 13, 2019 4:57 pm. Jockey Jay Ford has ended a Group One drought with Shraaoh’s win in the $2 million Sydney Cup. 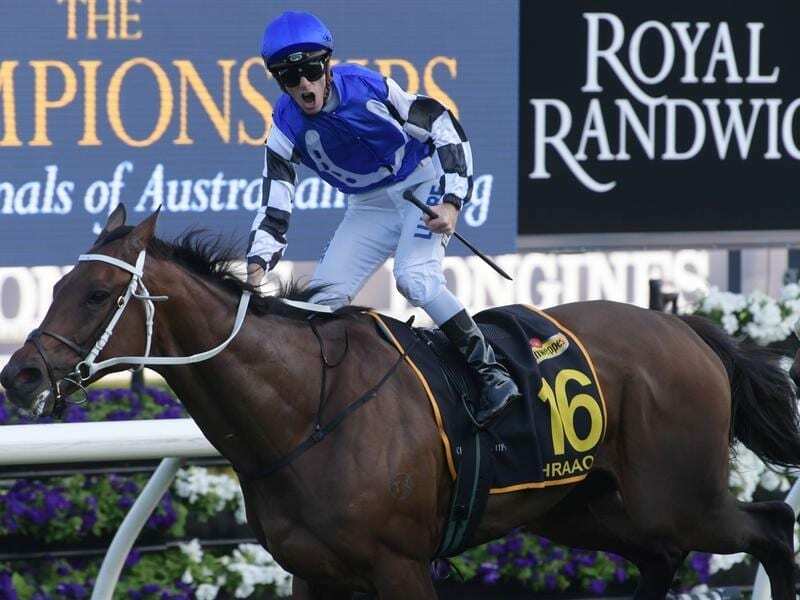 European import Shraaoh has continued a glory day for Chris Waller and broken an extended Group One drought for jockey Jay Ford with a tough win in the Sydney Cup at Randwick. Waller made it a Group One hat-trick after earlier winning the Australian Oaks with Verry Elleegant and Queen Elizabeth Stakes with champion Winx, a feat he achieved in the corresponding races 12 months ago. For Ford, the win was his first at the top level since Monaco Consul in the 2009 Spring Champion Stakes and a reminder of the heady days when he was the regular jockey of multiple Group One-winning sprinter Takeover Target. “It’s certainly pretty satisfying, I’ve ridden the roller coaster for a long time in Sydney,” Ford said. Ford settled Shraaoh ($16 into $12) better than midfield and with his mount full of running, he angled between the leaders in the straight to hold Vengeur Masque ($31) at bay by a long neck with Glory Days ($17) third. “From the half-mile he was always travelling and I was just pinching runs on the fence,” Ford said. Godolphin’s international raider Dubhe started favourite but was under the whip before the turn and never threatened. Shraaoh won the consolation race at Flemington on Melbourne Cup day at his first Australian start, prompting connections to set their sights on the Sydney autumn carnival. The major spring carnival staying races could now be on the agenda after the six-year-old’s win in Saturday’s $2 million, 3200-metre feature. “He won first-up over 2800 metres (at Flemington) and I think that’s a bigger training performance than Winx’s career,” Waller said, tongue-in-cheek. Shraaoh is raced by Australian Bloodstock and director Jamie Lovett was thrilled to get a share of the Group One spoils on such a significant day. “Obviously we bought the horse for these sort of Cups so it’s very rewarding,” Lovett said.